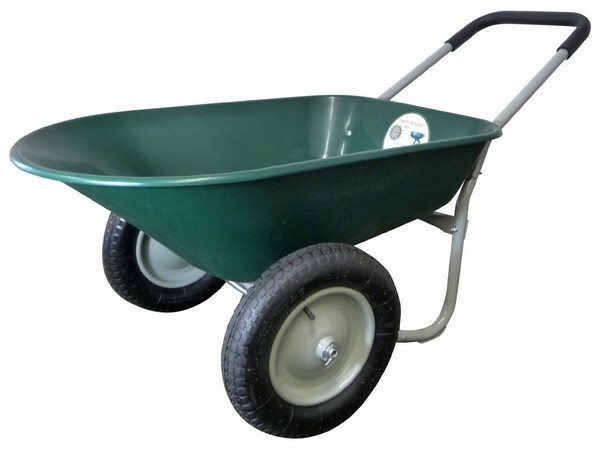 A wheelbarrow is a small wagon with one wheel and two handles at the rear part. The word “wheelbarrow” is composed of two words which are “wheel” and “barrow.” “Barrow” comes from an Old English word “bearwe” which means a tool used for carrying loads. Do you have a garden? If so then you definitely need a wheelbarrow. It is an important garden tool that can save you time and effort as well as prevent any injuries. Nowadays, there are a lot of choices that are available. 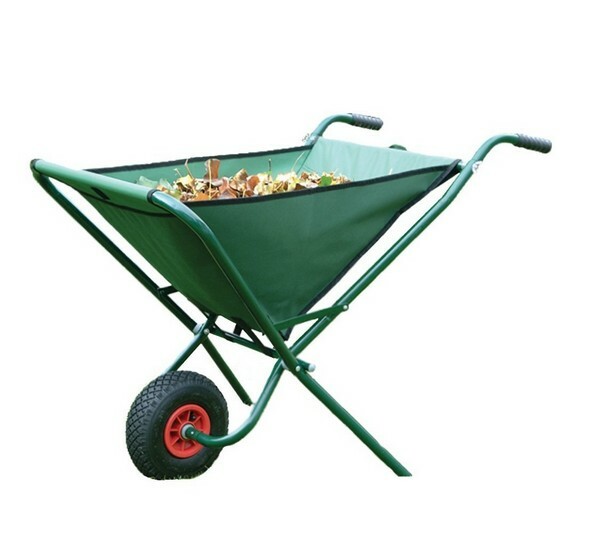 Typically, a standard wheelbarrow can be very useful in most gardens. However, if you have a big garden with an uneven surface or steep slopes then you may require a versatile one. 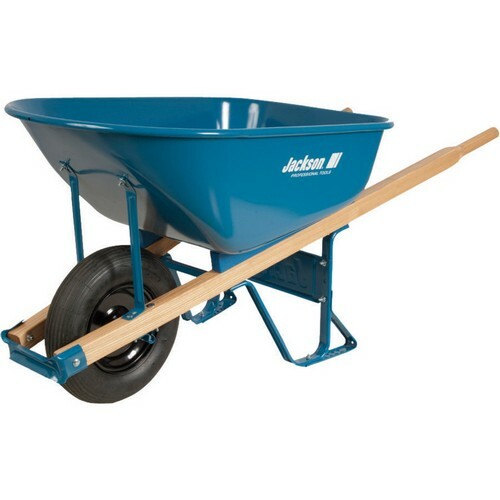 Choosing the best wheelbarrow can be challenging since there are various styles and brands on the market right now. Here, we will present to you some of the top-rated wheelbarrows with the best features. One of them might be the one that you’re looking for. 1. 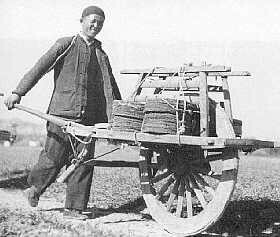 Mid Wheel – Wheelbarrows have been used by Europeans, however, it was actually invented by the ancient Chinese. The ones being used by the Europeans have the wheel out in front while the wheelbarrow used in China has a wheel in the middle. Since the wheel is placed in the middle then it can carry more weight compared to the European style. Nowadays, most of the wheelbarrows that are used have one wheel in the middle. 2. Extra Heavy Duty Front Wheel With Front Braces – This type is perfect for the bulkiest and most laborious workloads. They are highly durable so they can be used for commercial and industrial tasks. There are different sizes that are available depending on your particular workload. 3. 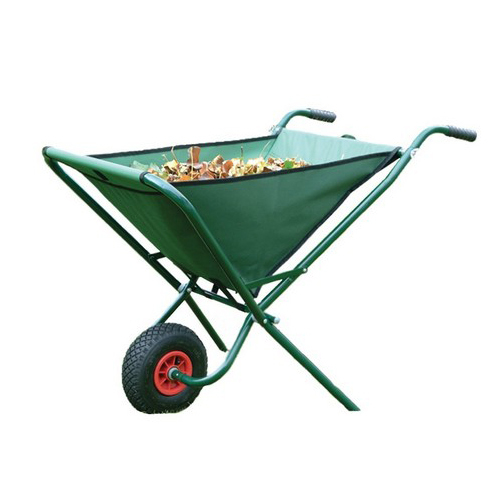 Wheelbarrow Cart – This is very useful when transporting materials around the garden. You can use it for carrying bags of compost, hauling ornamental plants or mulch. Using a cart can minimize the stress on your lower back and shoulders. Wheelbarrows are not only used by gardeners but also by landscapers, construction workers, and others. 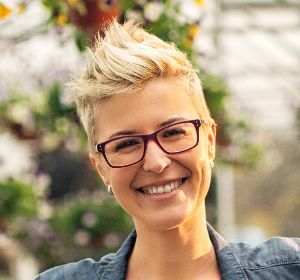 In these reviews, we will provide you detailed information on each product so you can choose the one that’s best for the tasks that you have in mind. Whether you are a green-thumbed novice or an ace landscape artist, using a wheelbarrow can surely make your gardening task a lot easier. Carrying and dumping of soil, leaves or mulch can be done quickly. Gorilla Carts Poly Garden Dump Cart is the best wheelbarrow. It consists of four wheels, making it easier to push regardless if it is fully loaded. 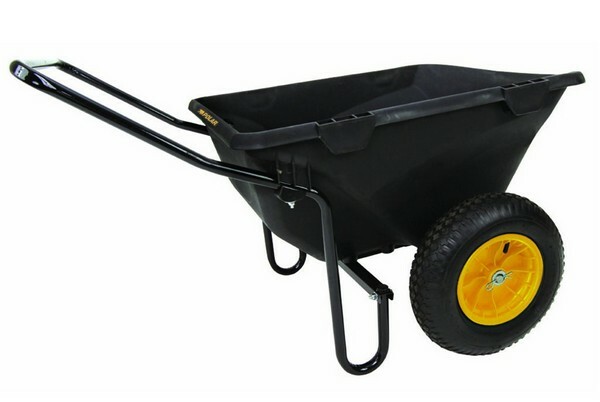 This wheelbarrow can easily roll over in an uneven terrain and big bumps. You just need to push down the rear handle so that the front wheel can climb up. A braking system is installed on the rear portion. It has a huge curved handle. This gives you a perfect balance to prevent any spills. 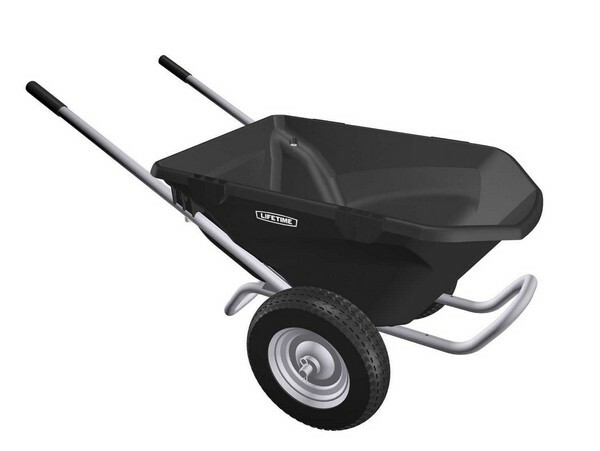 The United General WH89975 is the most affordable wheelbarrow. 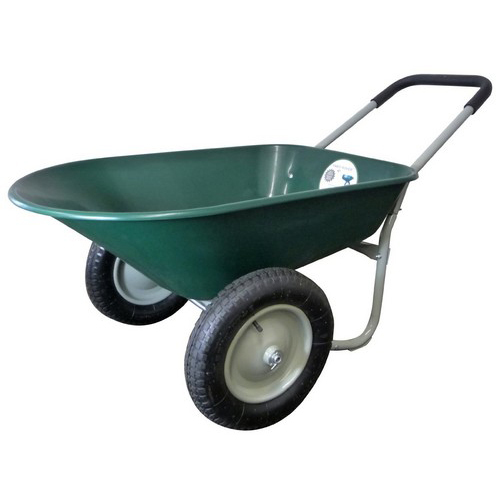 Although it might not be the biggest wheelbarrow, however, it is durably built and has a very reasonable price. It’s an excellent choice for a typical gardener. It looks brilliant in bright red. They’ve done a good job in painting this product and it looks like it can hold up excellently over time. The handles are made of solid wood. It has a durable metal undercarriage. This uses a huge 16″ pneumatic tire. 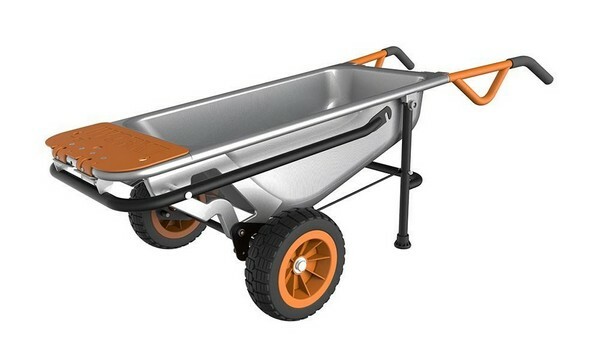 WORX Aerocart Multifunction Wheelbarrow is a cheap wheelbarrow that is multi-purpose. Although this may not be the best wheelbarrow or the best dolly, yet it’s very flexible and it can be used as both. It’s an excellent tool that can also be used as a snow plow or a wagon kit. It has a well-balanced patented design. No maintenance needed since it uses flat-free tires. This wheelbarrow has the capacity to haul up to 300 lbs of loads. 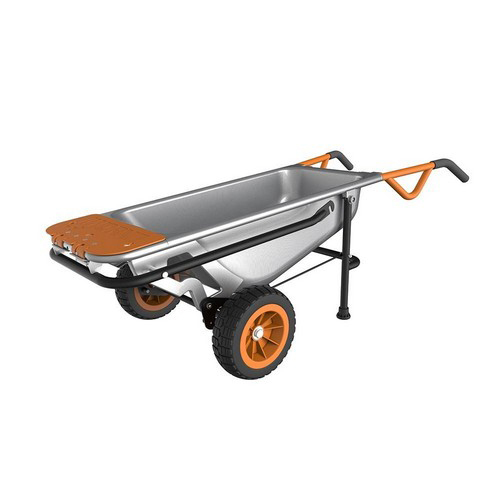 The Bosmere W302 Folding Wheelbarrow does not require too much space since it can be folded up. This is an ideal choice if you only have a small yard since it can be used for gathering leaves, twigs, and other featherweight loads. The downside is Bosmere W302 is not appropriate for heavier loads. It includes pockets which can be used for storing tools. When folded up, it only measures 13″ wide. The Marathon Yard Rover 70015 can be assembled quickly. Bolts are included. There are three colors that you can choose from. It is made of a rustproof poly plastic tray that can endure any abuse. This has a load size of five cubic feet. The only fault of this tool is that it will likely flex whenever you will dump a hefty load. It has a padded loop-style handle. The frame is made of powder-coated steel. 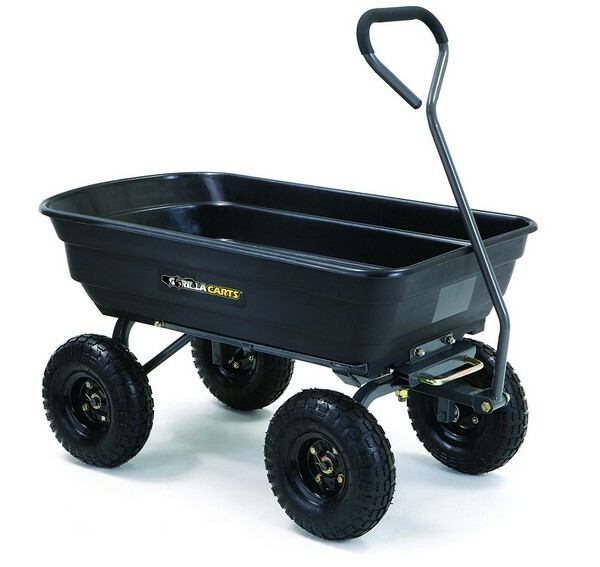 The Polar Trailer 8449 Heavy-Duty Wheelbarrow is ideal for heavy loads since it has a load size of 7 cubic feet. It measures 50x28x29 inches. No matter if it is fully loaded, it can still balance properly. This uses wide rubber tires that can manage all types of terrains. The only drawback is its handle has no padding. This tool is ideal for carrying rocks and logs. It uses shielded ball bearings. The Jackson M6T22 is a high-quality contractor wheelbarrow that has a load size of 6 cubic feet. One of its notable features is its long solid wood handles that can let you maneuver easily regardless if you have hefty loads. It has a heavy gauge steel tray that can last for a long time. The disadvantage of this wheelbarrow is its instructions are not finely illustrated. It uses a ribbed tire which can be pushed easily. All the components in this tool are made of high-quality materials. 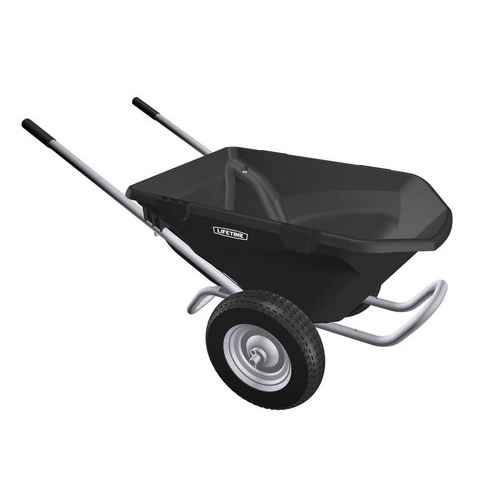 The Lifetime 65034 Two Wheel Wheelbarrow has a load size of 6.5 cubic feet. It can handle any type of jobs. This wheelbarrow is very stable with less tipping, thanks to its ultra-wide wheelbase and low point of gravity. Its frame is powder coated and weather resistant. It uses heavy duty tread wheels making it easy to roll over on any types of terrain. Dumping can be done quickly due to its tapered design. It can lighten your load and it can last longer. 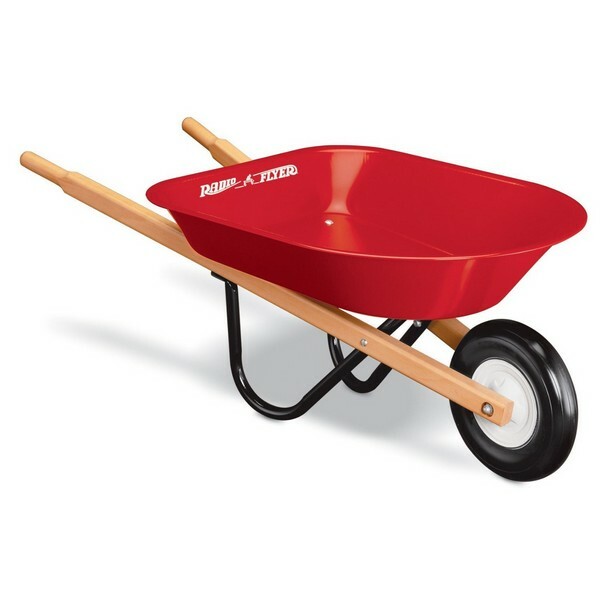 The Radio Flyer Kid’s Wheelbarrow is specially designed for kids to have fun. 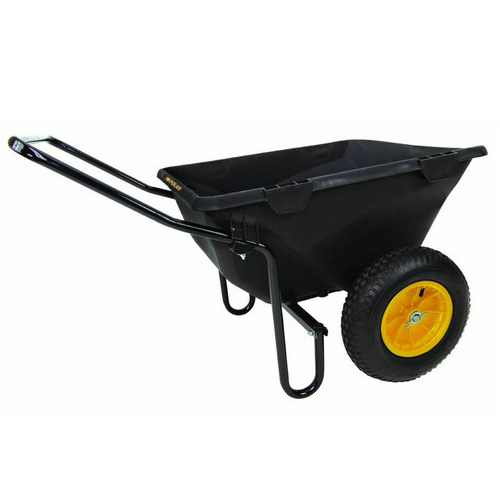 This is a sturdy wheelbarrow that includes a robust steel undercarriage which has the ability to support heavy loads. The handles are made of real wood which looks chic and authentic. Your kid will surely appreciate getting one of this. The steel tray is stable and safe. The wheel is sturdy enough and can easily roll over on different terrains. 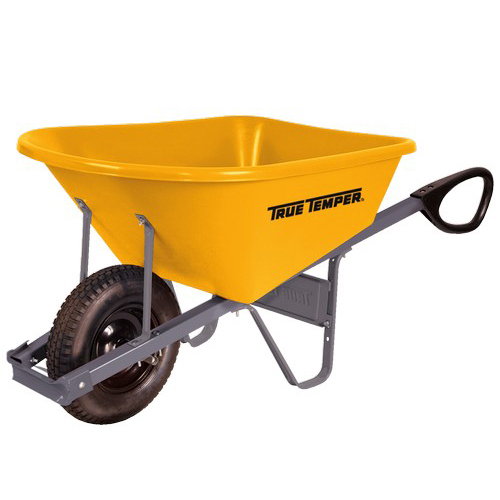 The Ames True Temper Contractor Wheelbarrow is dual wheeled and has a load size of 8 cubic feet. It is rustproof and easy to push. 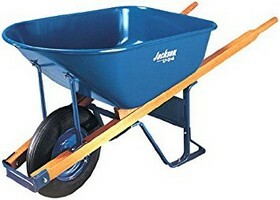 This is a heavy-duty wheelbarrow that has two hardwood handles. It is safe for kids since it uses phthalate and BPA-free materials. Its robust pneumatic tires can handle different types of terrain. It is very stable and has a heavy-duty construction. You can easily clean it using soap and water. This wheelbarrow can be assembled right away. 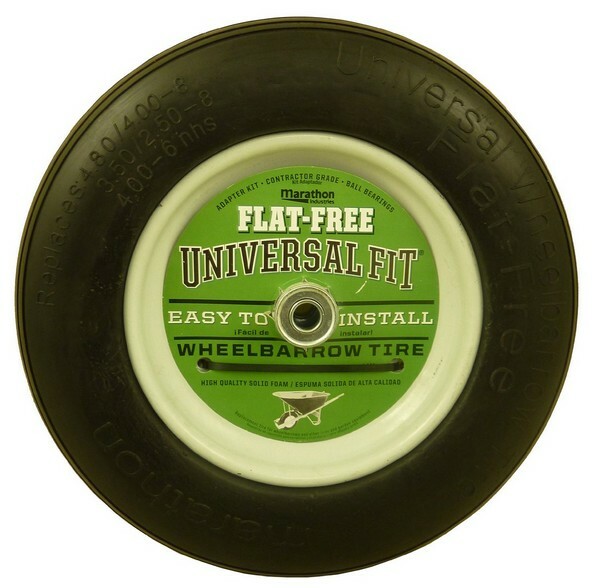 The Marathon Flat Free Wheelbarrow Tire can suit most wheelbarrows. It can fit different sizes and it can never get flat. This tire has a ribbed thread making it easy to maneuver in any terrain. It has the ability to handle a load capacity of 300 lbs. It comes with an adapter kit. 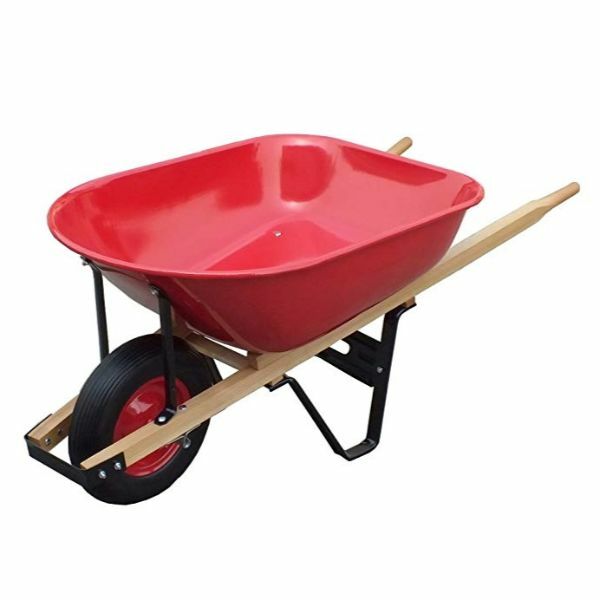 Although, vintage wood wheelbarrow may still exist, yet most wheelbarrows buckets that we’ve seen nowadays are made of steel or plastic. If you are planning to use it for heavier loads then the best choice is steel. But be sure to store it properly since it can be prone to rust. For light gardening, the best choice is plastic. It’s not only easy on your back but it’s also easy on your wallet. Although it is not prone to rust, it can crack when loaded with heavier objects or due to severe coldness. Some canvas wheelbarrows can be folded and easily stored in a garden storage. However, this is not designed for heavy gardening work. Traditionally, a wheelbarrow only consists of one wheel and it is placed in the center portion of the front. It is designed this way so that it will be easier to maneuver and dump, however, you need more strength to control it. 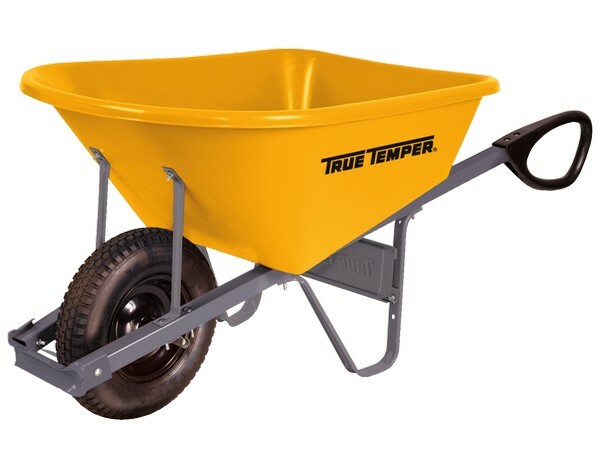 Wheelbarrows which have two wheels are appropriate for heavier loads and are more stable. However, you have to sacrifice the maneuverability. They are not also best on hills. The traditional models have straight handles for excellent maneuverability. It is also easier to flip, tilt or dump, however, it requires more strength. Closed handles are much easier to pull. Wheelbarrows which have pneumatic tires need to be pumped up just like bicycle tires. It can give you a smoother ride but they are also vulnerable to rough terrains. Additionally, you have to pay attention to its air pressure because it might go flat. Tires which are made of solid rubber will never go flat but they can’t give you a smooth ride. The in-between is a semi-pneumatic tire, which is a rubber tire with built-in air pockets. It provides you with some shock absorption but it does not need inflation. Wheelbarrows may look the same but they actually differ in a lot of things. When shopping for a wheelbarrow, always consider the tasks that you are planning to do and the terrain. Also, the maintenance and storage space. After making your decision then it’s time to go planting! Do you know that you can plant trees even if you have a small garden?